Gavin Massey has opened his heart to reveal the ‘agony’ of his long-term lay-off that’s robbing him of his Championship dream. The Wigan Athletic winger’s flying start to the season came to a crash landing when he suffered a freak hamstring injury at QPR at the end of August. He’s already looking at well into the New Year for even a hopeful return date. But as he takes the first tentative steps on the path to recovery, he’s still cursing his rotten luck at sustaining the problem in bizarre circumstances. 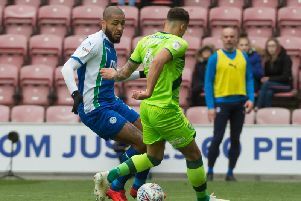 “It’s been so frustrating – even more so because it was such an unusual way I did the hamstring,” Massey told the Wigan Observer during a break in physio at the club’s Training Centre at Euxton. “I picked up the ball in the middle of the park, and kind of got nudged off it which caused me to hyper-extend my leg. “It was so strange, no-one had see it go like that before. “If it was the ‘normal’ way – when you’re sprinting and suddenly feel it go – then fair enough. “The doctor advised me to have the surgery – it would be better for me in the long run to get it sorted. “I had the operation which went fine, the physios were more than happy with it, so now it’s just rehab. “It’s small steps at the moment, it’ll be a few weeks before I can start to do some hamstring stuff. “I’ve been coming in to training, doing a bit, going in the pool, but it’s going to be a few months yet. “I’ve not been able to do too much yet because of the infection in my leg, caused by the scar being so big. The injury was even more unfortunate, given Massey had given a sparkling performance just four days earlier at Stoke, when he’d scored his first goal in the second tier in a 3-0 triumph. “I’d played two games that week, against Nottingham Forest and Stoke, and everything was going well,” Massey acknowledged. “I was pleased with my form, and there was so sign I was fatigued or this was coming. “To get injured in such a freak way – and find out it would be so long out of action – was so frustrating, a real killer. “Missing the games has been even worse because of the size of clubs we’ve been facing – and big grounds which I’d love to play at. There has at least some light in the tunnel, in the shape of the current international break. “The international breaks aren’t so bad, at least they give me an extra week to get nearer to full fitness!” Massey laughed.